Anita Anand and Giles Dilnot are joined by guest Eve Pollard. Now that the Prime Minister has called them 'unsustainable', can celebrity injunctions survive the onslaught? 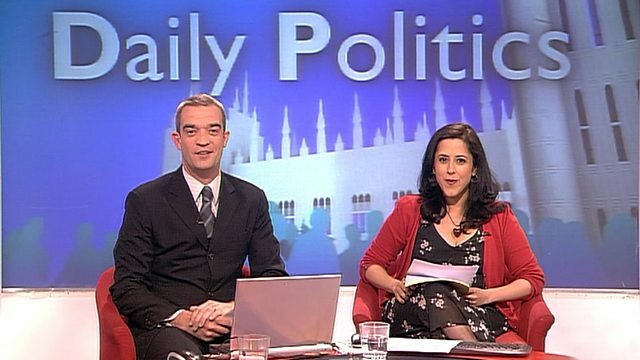 Anita Anand and Giles Dilnot present the top political stories of the day with guest, former newspaper editor, Eve Pollard. Now that the Prime Minister has called them 'unsustainable', can celebrity injunctions - super or otherwise - survive the onslaught? Fresh from his election victory, Scotland's first minister, Alex Salmond, comes to Westminster to ask for less tax and more autonomy, and also talks to the programme. The lot of a political wife. Do we still expect our mainly male politicians to have a beautiful woman by their side? A film looks into the subject. Do the circumstances surrounding the death of government scientist Dr David Kelly still need investigating?